At the New York press conference for the Martin Scorsese-directed, Hugo, a question about the film’s one hundred twenty seven minute running time and how it was expected that the children the movie was ostensibly meant for would sit still for that long. 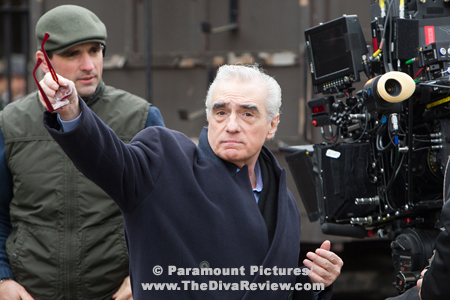 One of the film’s stars, Sacha Baron Cohen responded by praising Scorsese for making movies for himself, not for the audience or for focus groups and how admirable that was. I take his point, but then when one makes a film for oneself that is released to the public as a children’s picture, that creation is open to the possibility that no one will enjoy it in the vein intended by the creator. 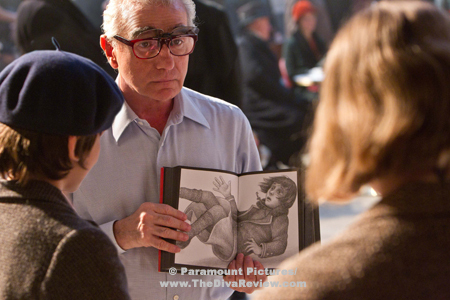 In the case of the adaptation of the popular children’s storybook, The Invention of Hugo Cabret, this is particularly risky as Scorsese has made it less about the adventures of its eponymous protagonist than a showcase for the director’s own legendary worship of film. 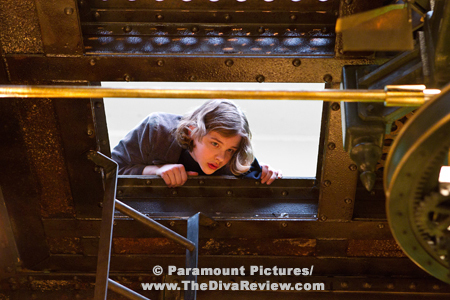 In the unseen world above a Parisian railway station, a young boy creeps about with a single purpose. 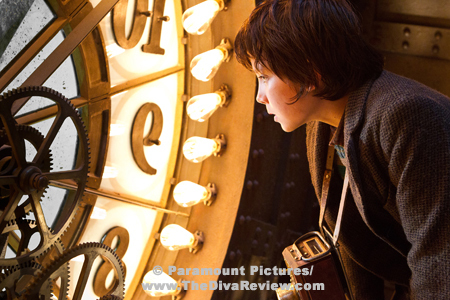 It is Hugo’s job to make sure the building’s hanging clocks, so important to the station’s travelers and staff, run with pinpoint accuracy. This career was left to him by a ne’er-do-well uncle who was supposed to care for Hugo after his father’s untimely death. Hugo scuttles about through tunnels and walkways from end to end of the station like a mouse, watching the comings and going of the flower seller, the newsvendor and the café owner, while steering clear of the station inspector. 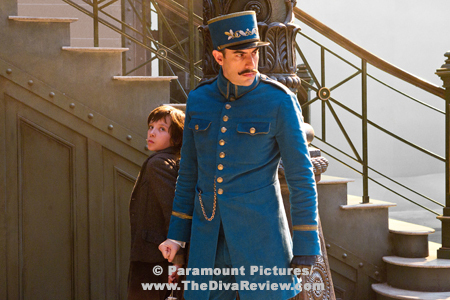 Hugo fears the officer might discover that the child has been left to fend for himself after his uncle’s disappearance. 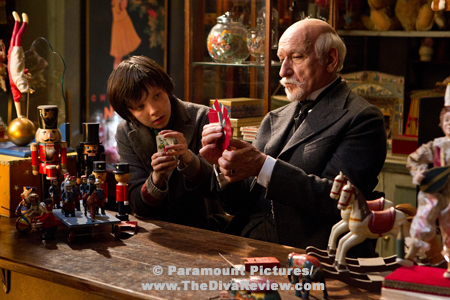 Of all the people Hugo observes, there’s none he watches as closely as the toy seller, whose booth is a treasure trove for the young boy who carries his dad’s love of clockworks and mechanics. 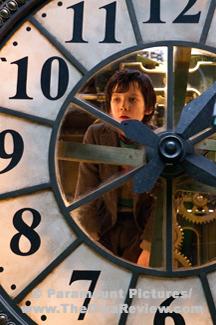 Hugo has pilfered various gears, cogs and other bits of metal for the project his dad never had time to complete; the repair of an automaton, a robot that functions on many of the same principles as the clocks Hugo fixes. Unfortunately, Hugo has stolen one time too many and the toy shop owner is cruel in his punishment, stealing something precious from Hugo in return. 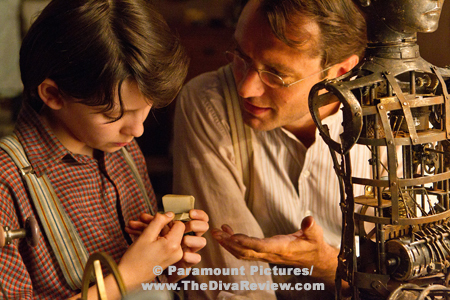 Hugo is tenacious in his quest to retrieve the manual that was hand-drawn by his father and the store owner is besieged by the small boy who eventually becomes the man’s apprentice. 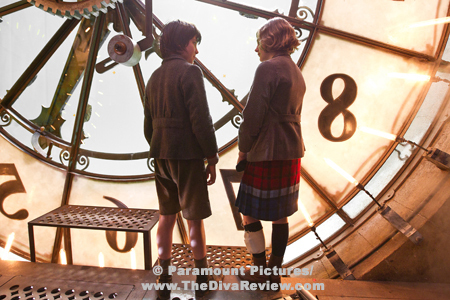 Before long, Hugo, with help of a new friend; the romantic, would-be adventuress, Isabelle, is able to finally piece together the writing robot that may carry a message and a mystery from his deceased father for his orphaned son to discover. The beauty of the heart of Paris is blooms lushly in every scene; the railway station itself looks majestic and pristine. Scorsese uses the 3D aspect of the film far less for the one of two moments of items lunging from the screen, employing it instead to add to the richness of the atmosphere, submerging the viewer into this world he’s created, custom made for a fairy tale, glittering and full of magic. For the viewer, the 3D component makes visiting the gorgeous, detailed world of Hugo like being inside of an opulent snow globe. 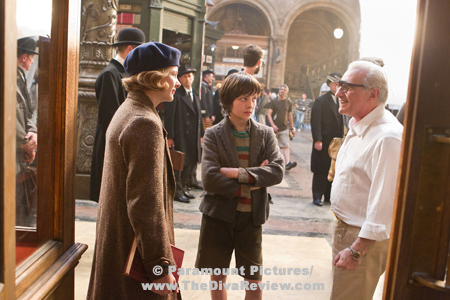 Would that Scorsese had taken as much care to center his tale on the charming story of the orphaned boy living in the train station. Instead, the film changes direction midway to become a storybook biography of film pioneer, director Georges Méliès, and to go on at length about the sanctity of cinema. 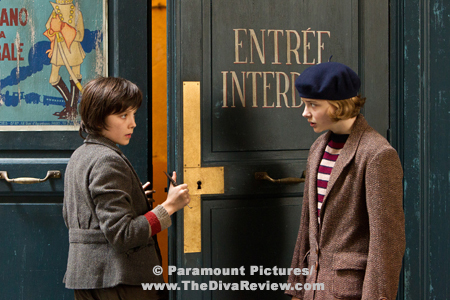 I tried to consider the film from the perspective of a viewer who was perhaps not a particular film buff or unfamiliar about the French director and wondered if his story, jammed into the middle of Hugo’s, would bear much interest? 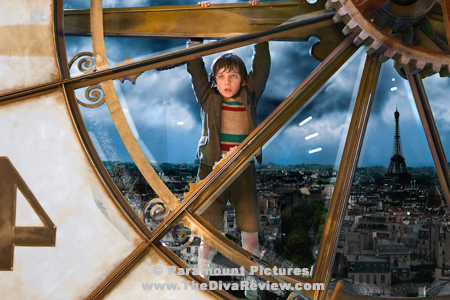 I thought even more about the children who would attend this film to see the story of the character they loved from Brian Selznick’s original story only to watch him be relegated to the sidelines as many scenes are spent on the silent film adventures of Méliès. 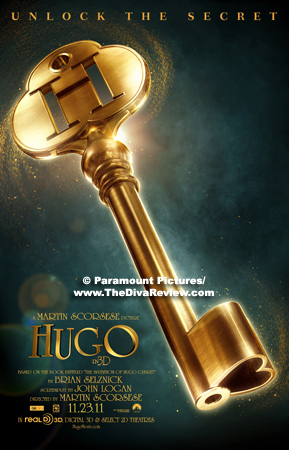 I understood that Méliès and the fascination with early film played a part in the literal Hugo’s story, but the focus in the book is firmly from Hugo’s perspective and we see everything through his eyes, including his good intentions to recover the old man’s dreams to him. 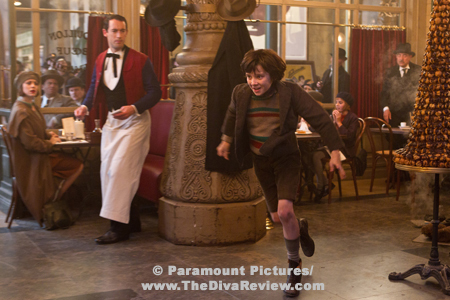 The heartwarming prospect of Hugo’s quest to find one last word from his father or his eventual forging of a family feels rote and unmoving because it becomes an also-ran compared to what seems to Scorsese to be the bigger story. It’s as if the director lost interest in the lonely, resourceful child after having found the opportunity to spotlight both Méliès and Scorsese’s own film preservation advocacy too irresistible not to feature in the movie that could bring him his widest audience based on the purported family-friendly subject matter. 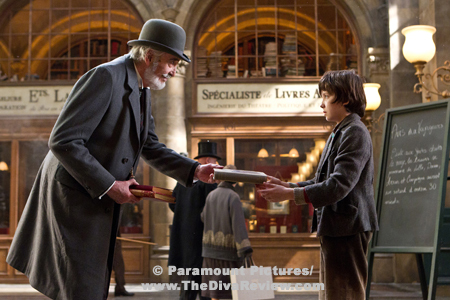 He certainly bites into these scenes with a cinematic brio that isn’t seen in the moments with Hugo. Lost with this choice are the truly charming subplots that take place around the station, including the film’s sole comic relief of the station inspector. 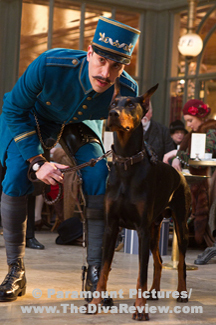 Sacha Baron Cohen injects the authoritarian orphan catcher, who prizes his Doberman sidekick and law and order above all things, with the absurdity and freewheeling slapstick for which Baron Cohen is famous. The movie is often dour and melancholy as if the director cannot summon the light touch needed to evoke true delight in this story and Baron Cohen’s scenes are some of the funniest in a film where humour and light-heartedness are in dreadfully small supply. 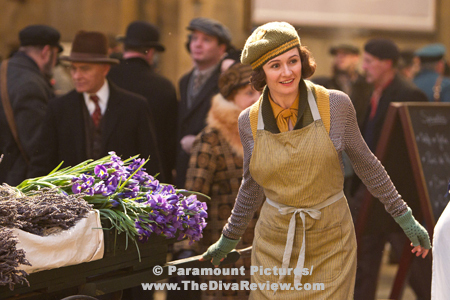 The inspector’s attempts at romance with flower seller Samantha Morton, looking adorably like a Charlie Chaplin heroine are awkwardly charming and show a side of the actor we’ve not seen. Also wonderful in milliseconds of screen time are Richard Griffiths and Frances de la Tour, also playing characters negotiating a prospective railway station romance if only the lady’s protective dachshund would let the gentleman within arms’ reach of his mistress. The character of Isabelle is one of the most refreshing females of any of Scorsese’s films. 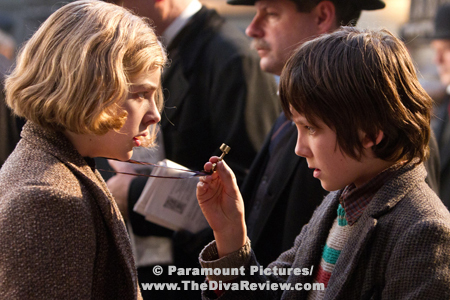 Chloe Grace Moretz is all coltish energy, poetry and dreams as the sheltered bookworm only too grateful to have a new, exciting friend in Hugo. Minimised somewhat from her presence in the Selznick book, it’s unfortunate that Isabelle basically disappears from the story altogether once she serves her purpose of providing Hugo with both the literal and figurative key to the automaton’s message. Any one of these charming tales could have been embellished upon and added to the magic of the main story, but like Hugo’s own, they are sidetracked. There is a sequence where Hugo has a nightmare is about nearly being run over by an incoming train that turns in time to save him, but by going off its rails, the locomotive crashes through the entire station. This is almost an allegory for what happens to this film; in seizing so heartily upon the Méliès’ biography, film preservation lesson and emphatic adulation of all things cinema, we lose sight of Hugo almost entirely. The problem with a now-you-see-him-now-you-don’t protagonist is it doesn’t help younger audiences with the over two hour running time, which is a trial for little ones who might be fidgety with lack of interest. 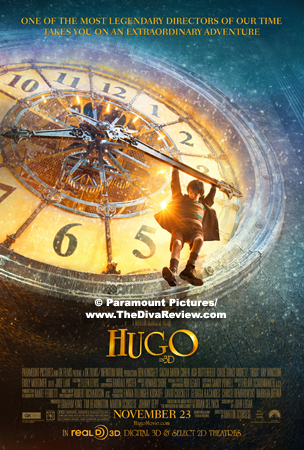 As such, despite the film’s glorious visuals and wonderful performances, one must wonder why the choice was made to make a film adaptation of The Invention of Hugo Cabret if Hugo wasn’t meant to be the centre of his own film?